From time to time we sponsor charities and a host of organisations across our seven offices as part of our corporate social responsibility (CSR) programme. The charities we select do vary from office to office but usually there is a local ‘affiliation’ with a particular charity or organisation which makes sponsorship especially rewarding for our team members. This includes at times, supporting charities where there is close experience of a condition/illness within the relevant office or one which affects immediate family of MFW team members. As well as sponsoring charities, we also like our sports and across the offices we also support local teams where we can. In addition to our corporate CSR work we are also delighted to report that many of the firm’s partners and staff also take part in many fund-raising activities in aid of charity. This includes anything from running marathons, tackling assault causes, taking part in Race for Life and Man on the Run races, fielding a football or cricket team to try and beat the local opposition, tackling the high and lows of long bike rides, testing the ‘old grey matter’ at a quiz night and even baking for charity (not to mention consuming mountains of cake all in aid of a good cause – (well someone has to do it). An opportunity recently arose for our Sittingbourne partners to sponsor a promising Kent goalie who happens to be the grandson of Teresa Cragen, MFW Sittingbourne Audit & Accounts Manager. The Sittingbourne partners were delighted to help Ryan with his sponsorship which he has used to purchase new kit for this season. We recently caught up with Ryan for some background information about his ‘goalie career’ and to find out his aspirations, in his own words. I started playing football on pitch in the position of CDM (centre defensive midfielder) with Thamesview U10’s. We won the Medway League three years running and the League Cup two years running. I personally won Player of the Match in one of these Cup Finals. When our manager took our team to the Kent League U13’s I was asked to change position to become goalkeeper. Our first year playing in the Kent League we finished 3rd and joint 2nd for the U14’s. Sadly, Thamesview have since folded after playing many years together. I trialled for goalkeeper and was selected to be their main keeper for the U15 season. I am really enjoying my time at Maidstone United and I am learning a lot. During a session at PSA Academy U10’s I jumped in goal and found I really enjoyed playing in this position and decided to start Goalkeeper Training Sessions to build my knowledge/skillset. I have represented PSA with my team mates in Barcelona, Belgium, Manchester and Wales. I trialled for position of goalkeeper at Medway for the U11’s and was selected to represent my district. I was keeper for Medway from U11 to U14 when I then went on to trial with the Kent Squad and was selected to represent Kent U15s. I was voted for Player’s Player and Spectators’ Player in U11’s and won Spectator’s Player in U12’s and U13’s for Medway District. I am the No 1 keeper for my school since Year 7. We won the Kent Cup in Year 7 and Year 9 and reached the quarter finals of the National Cup in Year 9. I was awarded Manager’s Player in Year 7, Player’s Player in Year 8 and Manager’s Player in Year 9. I attend First Touch on a Friday night for extra goalkeeper training. My coach Joe puts us through our paces but I enjoy it and I’m learning so much. I have represented First Touch as goalkeeper at Tournaments in London, Manchester and most recently in the Youth World Cup in Sweden where we finished 16th out of 194 teams from 64 nations. After successfully receiving a place in the Kent Squad I would like to say a BIG Thank you to MFW for sponsoring me, it means a lot and I hope to do you proud. Our Sittingbourne partners are delighted that they can help contribute to Ryan’s sponsorship and wish him all the best for this season and much good luck in saving as many goals as he can. They are amazed at how much Ryan has achieved so far and wish him much success with his goalkeeping achievements. So far, Ryan and his teams are already doing well having won a friendly and their first game of the season. A great result! All the best Ryan for a fantastic season. 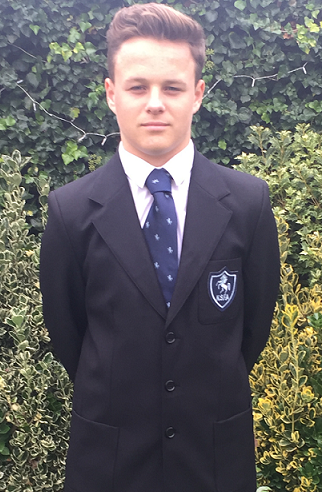 Photo caption: Ryan wearing his Kent Squad blazer.